Just about everybody thinks that President Donald Trump’s idea to hold a military parade in Washington, DC, is monumentally dumb. It’s actually hard to put into words how stupid an idea it is. Still, we were heartbroken when Trump canceled the event last month with a nebulous reference to another parade and a vague promise of maybe trying again next year. If our reaction sounds contradictory, please bear with us and we’ll explain. The whole point of this display of US military might was to stroke Trump’s ego. It’s a tried and tested way for strongmen across the world to feel good about themselves. 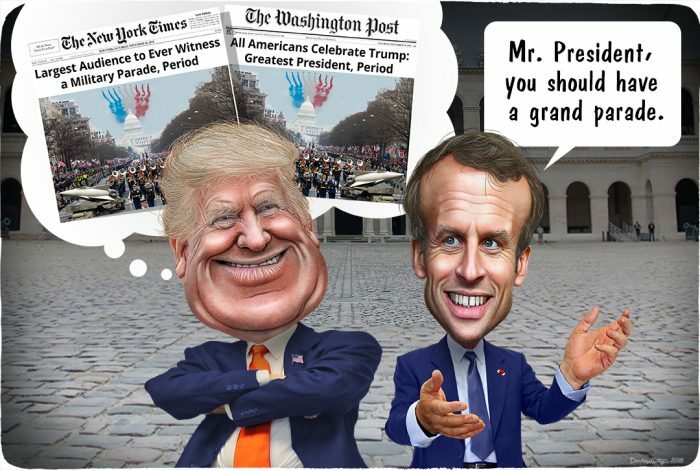 Naturally, the US president would be drawn to it, especially after witnessing the annual French parade on the Avenue des Champs–Élysées in Paris earlier this year. It makes sense that an insecure narcissist — who got a post-college deferment from military duty because of “bone spurs” on some heel or other — would want a military parade. After all, the marching soldiers have to salute him. So it would be the ultimate affirmation that he is loved. But what if the spectators turned the event into a gay pride parade and made it fabulous? Just picture it: All Trump wants is to sit in some throne-like chair and watch tanks rumbling by, obedient troops precision-marching, and airplanes flying overhead for a couple hours. Instead, once the parade starts, he is greeted by a sea of rainbow flags, Village People songs blasting through the streets, costumed dudes making out, and a phalanx of banners criticizing his anti-LGBTQ policies. One in particular that comes to mind is Trump’s decision to ban transgender people from serving in the military but there are many others to choose from. People who would want to protest other Trump policies would obviously also be welcome to attend. And there is no shortage of folks who have shown their willingness to travel to Washington, DC, to protest Trump. In fact, it is the one area in which this president’s “numbers” have actually been historic. The counter-parade would also be a great opportunity to model potential Space Force uniforms. The protesters would likely enjoy themselves a lot more than the participating troops. An informal poll of Military Times readers found that 91% of them oppose the idea of a parade. Ideally, the protest would be planned in secret, but there is no way to keep an event of this magnitude quiet. And once Trump and his allies get wind of it, they will try to portray this as an unpatriotic act — just as they did when NFL players protested police violence by kneeling during the national anthem. That’s why it would be important to make it abundantly clear that the protest is directed at the president and his policies and not at the people he is forcing to parade in front of him. As we pointed out before, it’s not their fault that idiot politicians keep sending them to fight abroad. So let’s give Trump his parade and make it so memorable he’ll never want another. The cartoon above was created by DonkeyHotey for WhoWhatWhy from these images: Donald Trump caricature (DonkeyHotey / Flickr – CC BY 2.0), Emmanuel Macron caricature (DonkeyHotey / Flickr – CC BY-SA 2.0), Pennsylvania Avenue (The United States Army Band / Flickr – CC BY 2.0), Les Invalides (The White House / Flickr), aircraft (Chairman of the Joint Chiefs of Staff / Flickr), and missile (Max Moreau / Flickr – CC BY 2.0).